I hate linen. I hate how it wrinkles of course, but I also don’t really like how it feels against the skin and how the weave often sort of reminds me of burlap. But when I spotted this shiny piece of ⭐️GOLD⭐️ linen at Tissus Passion, like the magpie that I am, I forgot any bad feeling I had ever had about linen and brought this beauty home. I immediately knew I’d make it into a pair of Deer&Doe Goji shorts, even though I’d had other fabrics in mind for those. 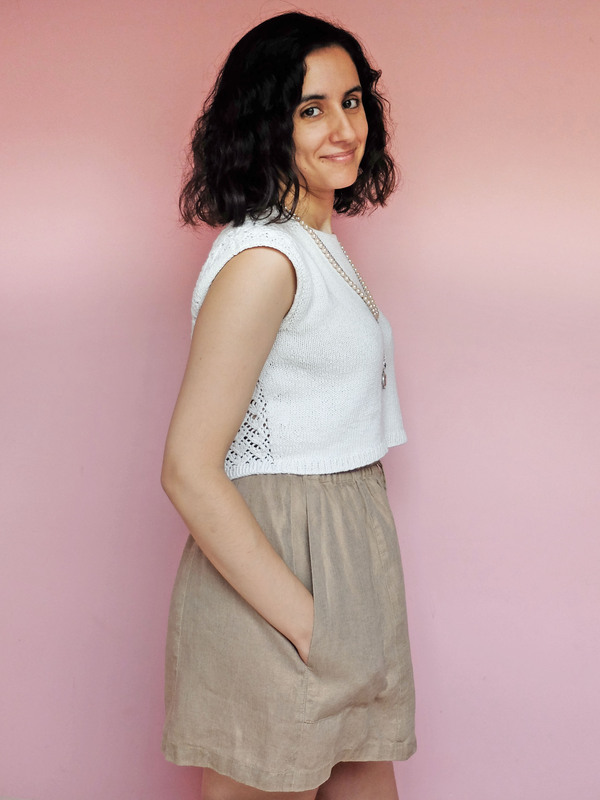 And I made them right before leaving for Spain last year, when I realised how in dire need I was of shorts. Making them was pretty uneventful: I followed the pattern to the letter and I don’t remember encountering even the tiniest problem. I cut a size 36 waistband, then traced the legs from a size 36 waist to size 40 hips. My hip measurements put me in the size 42 column, but I thought I could get away with cutting a hip size smaller with such a loose style. And I was right! Oh, and I was afraid it would be difficult to get in and out of the shorts with such a big difference between my waist and hips, but I was wrong! These shorts have been worn often enough last summer and this summer, but they could have been worn a lot more. Their only problem is… their fabric! It wrinkles SO. MUCH. I know I’m supposed to embrace the wrinkles, that they’re part of the beauty of linen, blah blah blah… I just can’t stand it! I feel like it makes me look so sloppy! This didn’t stop me from wearing these otherwise very cute (I love how they look like a very short skirt from certain angles!) and particularly comfortable shorts on very casual occasions (e.g. knitting afternoons on a stone bench), but I know I would have worn them way more often had I made them out of a cute cotton or viscose. At least now I know for sure. I. hate. 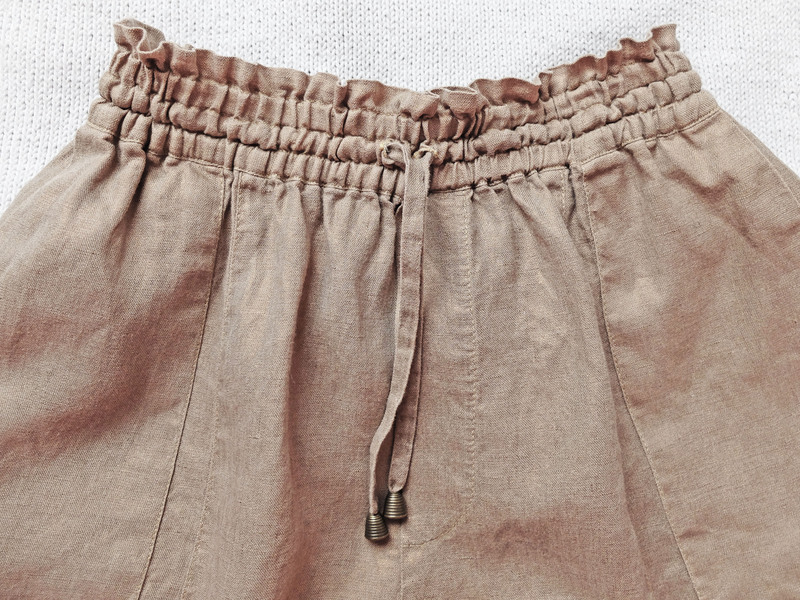 linen. I took these coming back from work yesterday around 3 p.m. (lucky me finishing so early! 🙂 ) and I barely had enough light long enough to take them. So, this is the outfit I made to wear on Christmas Eve. Last year I made the dumbest choice by wearing this skirt which, although very comfortable for daily wear, became an instrument of torture after I had ingurgitated Christmas dinner. Which is why this year I decided I needed the most ample dress possible in order to eat as much as I wanted and not feel like my clothing was trying to kill me. Enter my beloved modified babydoll Renfrew dress that could hold triplets and a whole turkey! I sewed the waist gathers the same way as for this one (this gathering method makes for a very loose-fitting waist), the sleeves are 3/4 like on this one, but I used a different method for the neckline: for once I didn’t use a band but simply turned under the neckline edge twice. I felt it was dressier. The sleeves are wide enough for me to layer a 3/4-sleeved T-shirt under the dress for maximum Christmas (and cold weather in general) cosiness. I did not add pockets for lack of time, but I’ll probably add some in the near future because I keep reaching for them when I wear the dress, and of course I don’t know where to put my tissues. 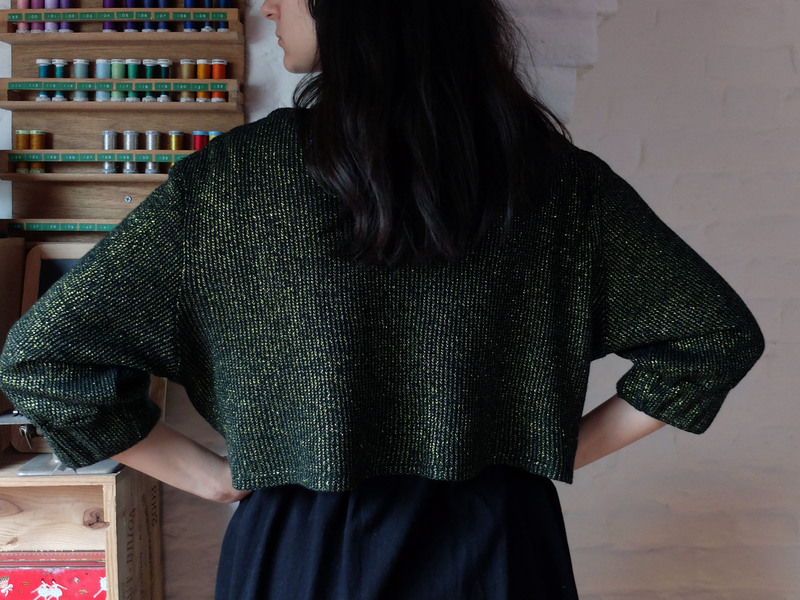 The cropped sweater started its life as a whole nother project. 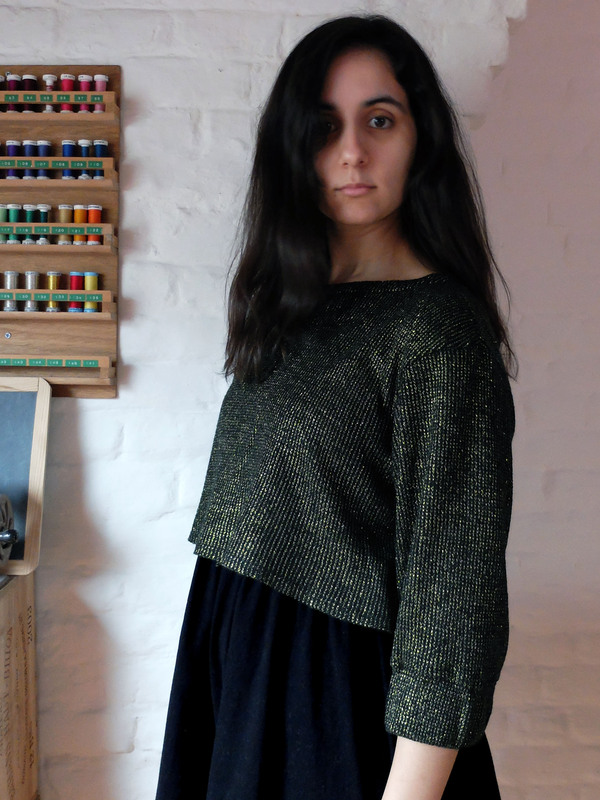 I wanted a cosy sweater dress made from this glittery sweater knit I had recently bought, but when I tried it on I realised it looked positively awful on me! I have no problem wearing things that don’t make me look as thin as possible, or that make me look pregnant for that matter (I guess the outfit I’m showing you today kind of proves my point! 😀 ), but I do wearing things that make me appear deformed! I put the dress aside, feeling there might still be a way to rescue it, and when I started thinking about my Christmas outfit, I immediately thought simply cropping it might make it the perfect companion to the little black babydoll dress I had in mind. And indeed it did! I must have been Captain Harlock in a previous life! 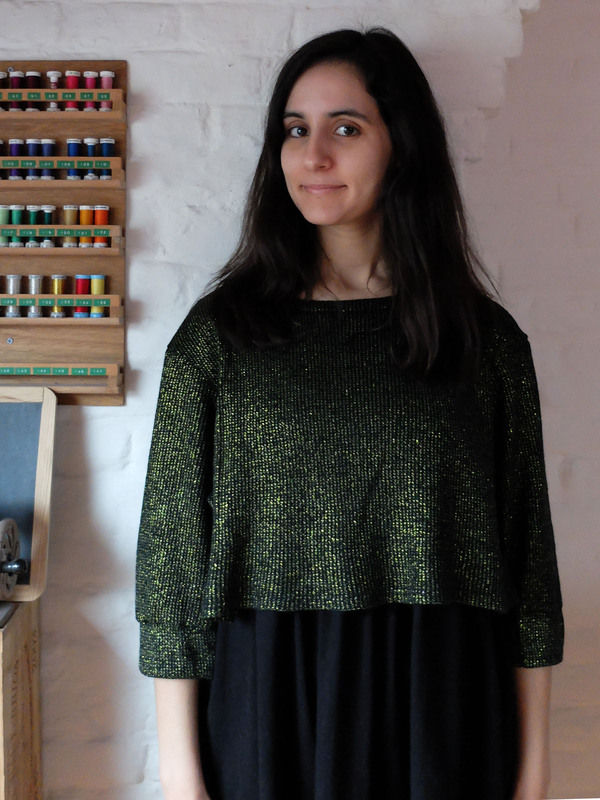 I also cropped the sleeves, which were about as unflattering as the rest of the dress when they were full-length. Since my fabric has mediocre stretch recovery, I put some wide elastic in the cuffs to prevent them from getting distorted over time. It does feel pretty stiff, which was weird at first, but it doesn’t bother me anymore. The original collar of the dress also stood very weirdly and/or didn’t suit me at all, so I simply turned it under and topstitched it in place. I was surprised by how good it looked after this simple transformation! 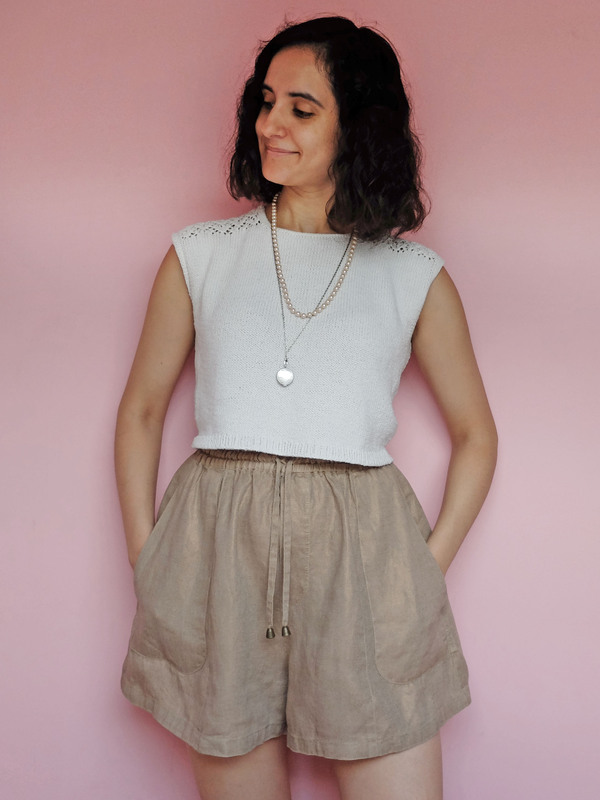 I have been wearing this exact same outfit a lot since Christmas, but I haven’t worn the two pieces separately yet, which is weird since a black dress and a neutral sweater (gold and silver are neutrals to me – I’m not even kidding!) shouldn’t be too hard to combine with the rest of my wardrobe. I guess I just like them so much together!